Revamp your American spa into a multipurpose entertainment space with Metro Surrounds. An adjustable system of steps, benches and bars. Metro surrounds may be combined to create the perfect indoor or outdoor living area. Metro sections create a seamless and custom look, sharing the color palette of your American Spas Hot tub. Built to last using the same high quality, durable, all weather resistant materials precisely matching the standards in artistry of American Spas. 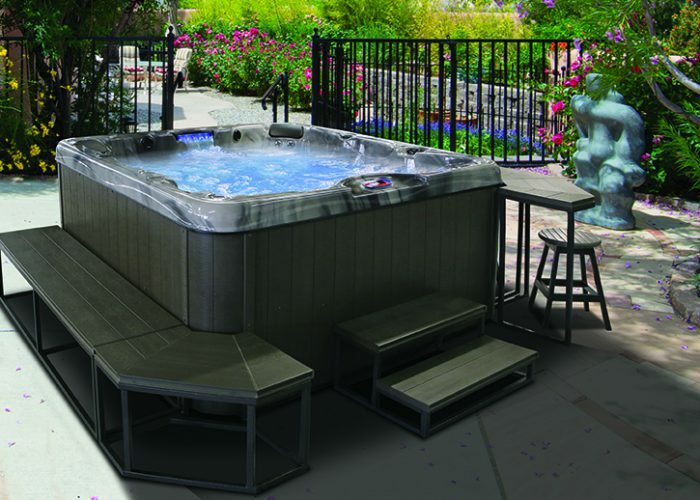 Metro surrounds adds a whole new level of personalization and exquisiteness to your hot tub experience. Available in two lengths 21″ x 30″ x 14″ small two step design and the larger 21″ x 58″ x 14″ two step design to compliment your American spa and make it easier and safer to get in and out. Thick composite wood that holds traction when wet, and feel much more secure than cheap plastic hot tub steps. Benches, corners modules may be combined to create a partial or full hot tub surround. All modules are sturdy and secure and may be used for anything from group seating to hot tub access. Bars and Stools can be combined on any side of you spa to ensure your continued interaction and entertainment fun with people inside and outside the hot tub. These modular pieces can also be used as stand alone bars. Get your American Spa now and rest assured that we manufacture modular pieces to effortless show off your spa and make a multipurpose area anywhere inside or outside your home. Buying Options for Metro Surrounds are Available for all three colors options. IF you have more questions about purchasing a spa please contact us for more info.